Apparently Olive Garden has stepped up their game recently. I’ve been told I need to try it again. Tuesday was my first time there but that potato sausage soup was really good. Plus they serve taste tests of complimentary wine. Top_Dawg thought he would pop in for a bite after getting snapped up at Sherbrooke Pub on Saturday. Sealed up tighter than a nun's poonani. Big ol' notice on the door saying they owe 26 large in back rent. Won't be seeing them no more. Not like it was "fine dinning" but Burger King on 137th Ave Clareview is closed. As of February. Its been there in that location since the mall opened. stopped in at the red ox inn. Food was good but the service was ridiculous. Waitress laughed at us when we asked why the menu was different then their website. Drinks took forever to come out. At one point she brought the wrong drink. When this was pointed out to her when she came back to the table she decided to bring it to a different table. She didn't know if anyone drank some of it or did anything to it... but hey let's give it to the other table. That's too bad for it is one of my favourite and service was always attentive and professional. Home of the three hour meal. He doesn't do the sit around for hours circle jerk love ins. Get in-eat-get out is Top_Dawg style. Baekjeong opened up in the south. Had a chance to try it yesterday and it was packed to the gills, so make sure to make reservations. Delicious but be prepared to smell like meat afterwards. ^this isn’t instagram. If you’re going to post a picture, make it relevant... like, where does this wonderful looking meal come from? Whoops, my bad... the text didn't seem to copy over. Great service, good food if not a bit salty. Yum. Thank you for adding the details. Pricing??? I'm on board if that's red cabbage but it looks like shredded beats. I was out at the Nodoru Ramin bar Sunday afternoon. Not ad. It was pretty busy. $225 for 4 of us with a bottle of red. Grilled meat on stick, okonomoyaki and beeru at Wishbone. Hit De Dutch sunday for brunch . Had the Amsterdam bene with the rusks and fruit bowl. Jav and OJ. Mmmmm yummy. ^ We'll have to check that out, it looked pretty busy last time I booked a 10-6 Saturday shift. Good ratings too, thanks. ^^ I went by there Thursday noticing the sign on the North West side of the building facing 101st, but I spent my wad at Long & McQuade. Last edited by envaneo; 23-04-2018 at 04:11 PM. Black Pearl Friday for baked oysters and a Manhattan ..... bit expensive, but good for occasional special occasions. Great to see Bottega with a sidewalk patio - always loved their food, just couldn't have a half-way decent conversation inside though. By far the best food in Beverly!! Great vibe/decor too. Please check it out if you in the hood! Not sure if it’s been mentioned but Packrat Louis is being rebranded as Bottega 104. So that's where all the sows moved since The Gas Pump shut down. Eclectic mix Top_Dawg has to say. Condom always has this man-man love vibe. Top_Dawg went there a few days ago to smash back a coupla brews. Every year-and-a-half he goes there. And it reminds him why he never goes there. Just bad on so many levels. Great place, went for coffee with a friend this morning. Owners are very nice people and the decor in the cafe is beautiful. I would highly recommend stopping by for coffee or lunch. 5 out of 5 stars! Gui Lin Noodle House on 97st/106ave. Simple, delicious. Speaking of dishes, has anyone tried "Skip the dishes?" Are they any good? Hallway Cafe + Takeaway in City Hall - $9 breakfast! Keep an eagle eye on your cell phone and laptop. ^don't continue to be such an incredible prick. Took the fam to The Marc tonight for some terrace. I ask because people have been saying negative things about their competition. I know what "Skip the dishes" is. This thread is titled "Must try" isn't it? And that's why I asked. So if someone wants to order delivery, from a place that delivers a range of choices, they shouldn’t and should go to McDonald’s or the like instead because then you wouldn’t consider them lazy and the effort would be worthy of “nurishment?” Wtf is wrong with you? I can think of a zillion reasons why someone would order from skip the dishes or similar services. Don’t be a tool. Personally I find the service delivery fees and tip on top of it to be expensive. If a restaurant already pays a significant % of the order total to the delivery service, why am I paying 25-30% for delivery and tip on top of that? I mean, I get it... but I would rather call the restaurant, order and pickup or go out to the restaurant and dine in. So simple and so incredibly delicious. This is the bar. I also tried this dish recently and have nothing be great things to say about this restaurant. Really really delicious food. Holy **** man!!!!! I just read your insane rant towards me.....you just justified my earlier point....ToolBoy!!! Also tried it, amazing. Had the beef carpaccio. Stellar. Expensive but worth the experience once in a while. Parmigiano Soup with bacon and leeks at Bundock ... $9 steal! Boulevardier cocktail - best I've ever tasted, anywhere. Baked oysters (with parmigiano cream) at Black Pearl or, Honey nut Lobster, Prawns and Scallops at $23. Start with a wood steamed old fashioned. Yeah, toffee name .. and nowhere the same ingredients, but 100% alcohol (which I suspect you'd like), but almost like a Manhattan - only even better. If you want to see some local restaraunts and businesses team up and attack someone who wrote a bad review you can check it out here. I guess you can't write a bad review. For whatever reasons the owners and many businesses decided they needed to attack this foodie for their review. Seems some of the businesses have started to delete their comments while others are threatening to blacklist that food reviewer from becoming an influencer. The perpetrators of this apparent harassment seem to have bought into the narrative that their operation of a private, for-profit business is actually in the interests of the public good and that therefore they are deserving of our charity. This is an attitude that unfortunately permeates from the top down in this city. Jordan Watson - co-owner, Cartago: "“down hill” “worst” those are bold words. If you respected them so much why didn’t you say your piece with one of the owners instead of slandering a fantastic place that has made Edmonton such a cooler spot then our typical. You decided to post this on a Saturday after so much contemplation. Not exactly a Edmonton team player are you?" gogrego - The Common DJ: "Uneducated uninformed garbage review full of lies. You slander people who have helped build this community and city. What have you done for this city? What have you contributed? Your’e not a food critic. Never forget that. You’re a little goblin who hides behind a computer pays for instagram, followers and writes ********." sukaclothing: "also if you are a female you should support the fact that one of the owners is a badass chick who is killing it and inspiring others to also do so .... #support local and do your research"
^I like the Common but man what a bad idea it was to pile on to a uncharitable instagram review. 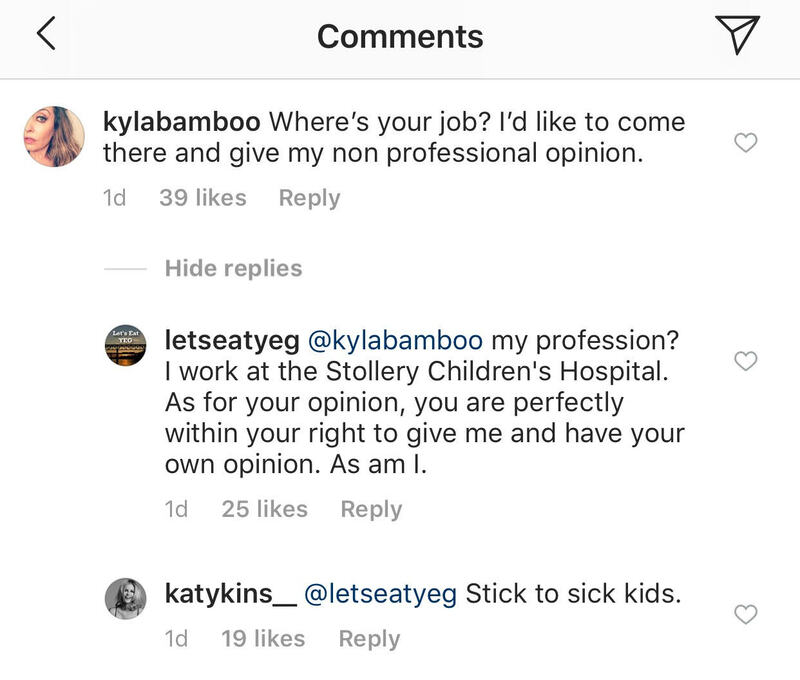 And then you have one of the owners from Bamboo Ballroom and Cartago rushing in to help her friends...after Katy (Cartago) found out the instagrammer worked at the Stollery, she told her to "stick with sick kids"...as oppose to reviewing food i guess? "Where’s your job? I’d like to come there and give my non professional opinion." “down hill” “worst” those are bold words. If you respected them so much why didn’t you say your piece with one of the owners instead of slandering a fantastic place that has made Edmonton such a cooler spot then our typical. You decided to post this on a Saturday after so much contemplation. Not exactly a Edmonton team player are you?" "Uneducated uninformed garbage review full of lies. You slander people who have helped build this community and city. What have you done for this city? What have you contributed? Your’e not a food critic. Never forget that. You’re a little goblin who hides behind a computer pays for instagram, followers and writes ********." I don't know why he would post if he had nothing nice to say. I read through his other reviews on IG and all of them were positive or if he had something negative to say, it was minimal and balanced with positive comments... Regardless, I will add him to the blacklist when it comes to "influencers" to work with my clients and tell other industry folks to do the same. Love the Common, the staff and all the connected businesses! Sad he decided to burn bridges instead of contacting the Common directly about his experience. Makes our city look like its run by a bunch of tight-knit insecure, crybabies who think they are "elevating" Edmonton. Last edited by B.ike; 19-07-2018 at 09:25 AM. Edmotnon local business is very cliquey. But this was a whole new level of absurdity. I was just about to lost this in this very thread, but I'm glad it was picked up and posted. I've been and friends have been shooting this around social media and Jesus we have a new opinion of them. In private, I heard and interacted with them as private citizens and what can be said is said... but using Instagram, your "brand" medium, to say stuff like this... ouch. Caught in the rain while on a ride, so I 'had' to have brunch at Cafe Bicyclette. The best pain perdu I have ever had. The Common friends and owners all seem like douchey trust fund kids. Or.... hard working entrepreneurs with multiple, local, independent businesses who helped make Whyte Avenue trendy and unique, followed by adding to the culinary scene both there and Downtown. One was one of Edmonton's top DJs in the 90s/early 2000s and all of them have worked their asses off to be where they are. I am not defending them or those comments, just educating you on what's what. Sounds like you are defending them... Expected from you. You're another that's come from a privileged lifestyle afforded to you by your parents. Typical;... entitled kids coming from well-off parents. Last edited by Medwards; 23-07-2018 at 08:51 AM. or when they fail, they'll have mommy and daddy rescue them like nothing happened. ^^^More conflation of business and charity. All that does is create low standards and engender the attitude that this kind of nonsense is somehow trendy, unique, and worth $23. Last edited by OffWhyte; 23-07-2018 at 08:59 AM. Pretty sure I said NOT defending them and I agree that people should be able to criticize food or anything else for that matter if they have the basis to do so. Again, do you know them? Do you know how fcuking hard it is to be in businesses as long as they have with multiple independent companies? I bet those sauces are straight off a sysco truck too. Pretty sure you are defending them, and your newest post now confirms you are CONTINUING to defend them. Christ man. Do I know them directly? No. Do I know of them? Yes. Have I been in their businesses both in current location, and previously on 124th? Yes. Do I know how fcuking hard it to be in business? very much so. Does being in business excuse this behavior ? Absolutely not. They deserve all the hate they are being sent. Christ man, what are you saying? You're twofaced again. "not defending at all, but do you know how hard".... Sounds like an sideways intro to an excuse if I ever heard one. It's supposed to be hard to stay in business; that's how it works. The minute it becomes easy standards slip. So in response to their poor, insulting behavior on social media you feel a rational course of action is to also behave poorly and insultingly on social media? Douchey, indeed. Criticize their behavior or the quality of their service/food, fine. By calling them "trust fund kids" and other insults, you're just showing you're no better than they are. Congratulations. So in response to their poor, insulting behavior on social media you feel a rational course of action is to also behave poorly and insultingly on social media? Douchey, indeed. behave poorly? You mean calling a spade a spade? What? You expect people should just push this under the rug silently? That's exactly what the Common folks hoped would happen... that nobody would notice their posts. i've seen kids in a sand-box carry on more civilized disagreements. maybe you could both just hold your breath until you turn blue instead of filling up posts and threads ad infinitum with your brand of sand for a while? it's a discussion that's NOT ABOUT YOU and your insisting that EVERYTHING IS ABOUT YOU AND THAT YOU'RE RIGHT ABOUT EVERYTHING ALL OF THE TIME simply shows neither of you understand. I'm sorry Ken, but when folks use this as an opportunity to call out people they do not know, have no idea of their financial situation or backing and then talk about how they had it easy when I can assure you they did not, I won't stand for it. 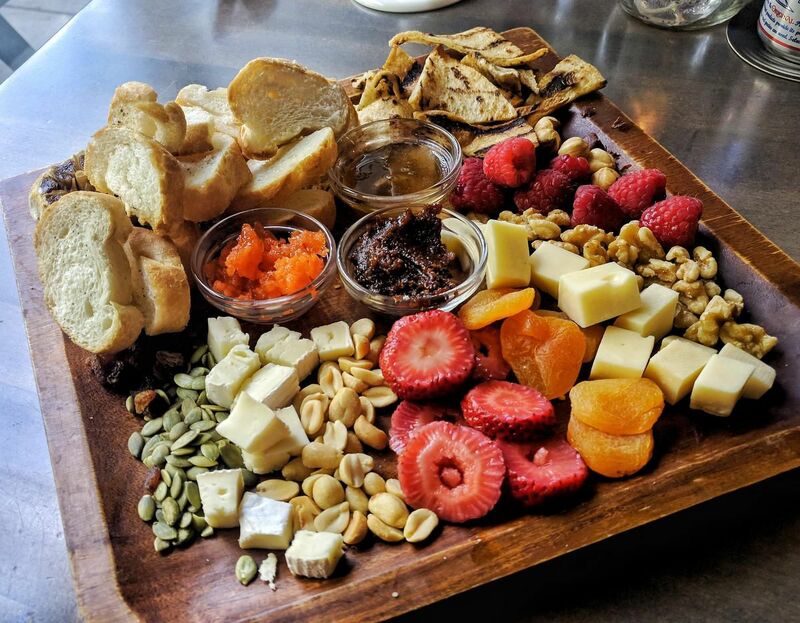 Friends and I tried out Why Not on 109st/85ave on Saturday and quite enjoyed most of it. Drink selection was spot on for me, other than only 1 R/W to choose from. Service was friendly, attentive, but needed to review their current offerings a little more closely. Loved the little room, wish the COE gave them their patio license. Christ man, I dont know how you can continue to defend these people, did you miss what they wrote? They deserve all the attention they are getting. Even if they did work very hard to get where they are, they come off as entitled trust fund kids, regardless of if that is even true. This sounds exactly like one of the responses that set people off. Many of the business owners were yelling at people saying the exact same thing. Do you know what they do for our city? Do you know how important they are?? Wtf does that have to do with multiple businesses teaming up on someone who reviewed the food? It means nothing. You don't get a free pass to attack someone and bully someone into submission. You had social media businesses threatening to black list the food reviewer... nothing the business thinks it does for the community means anything when they want to attack someone the way they did. Perhaps the business needs to reminded that it's the community that does everything for their businesses by supporting them with their money. Last time. Reviews, criticism, accolades of restaurants is normal and I disagree with the stuff above and coming to the aid of someone because they didn't enjoy a meal. That is very subjective. What I do think is BS is criticizing them because you think they had it easy, were trust fund kids, didn't do anything to uplift this community and put their entire livelihoods on the line. Their heads are so far up their asses that one must think wtf were they thinking. The owner of cartago refused to apologize or talk to the star reporter. They come across as entitled and that's being extremely polite. What they've done, how much money they spend on their businesses or how important they think they are does not give them a free pass to do what they did. There seems to be confusion among the apparently douche owners of cited establishments about not biting the hand that feeds you. Perhaps because they are feeding people they think that customers are inured to them beyond paying the bill and tips. That this person was attacked for making a perfectly valid and honest review is reprehensible. In the case of restaurants, the one feeding is actually the customers, the one biting are the establishments lined up to attack this paying customer. Customers are the reason establishments exist. not the other way around. Looks like I can scratch off trying several of these DB type establishments. I don't think I could stomach the plates being depicted in anycase. What deplorable plate presentation, food, and fare. Diminished standards indeed. The business owners had no difficulty calling out the paying customer that they didn't know. Doing it ruthlessly as well. Not only is this avarice its a public display of online stupid contempt for its customers. I mean the comments are in contempt of the reviewer. They are even spiteful. What purpose is served by businesses roasting their own customers? Trust fund or not, that is entirely beside the point. If you're in the hospitality industry, you're going to get negative reviews. It's how deal with it is the difference between professionals and not. There is no excuse for calling out a customer. You can deal with it in a professional manner, and if you can't resolve it you just take the heat and move on. Well if what you say is true, its certainly foolish to respond to someone on social media the way they did. They couldve tried the more common approach of “sorry you felt that way, please come back and let us show thats not the common experience”. The way they post and attack a customer in a public facing social media account is coming across as “douchey trust fund kids” sorry if they are giving that impression, and the more I read in to this, my perceptions of this really are not changing. That ' pain ' looks like it desreves to be ' perdu '. The blindness and lack of appreciation to ones own perceptions and those of other posters on this forum is amazing. Being in business, independently, for so many years does NOT excuse the behaviour they exhibited, nor does it, in everyone's opinion, mean they have done a lot for the community by ways of just having the businesses open. It's clear from the many many comments on various sites, that while they are successful, they may in fact not be at the same standard they once were, and the public can choose to share that opinion anyway they choose, whether the business owner appreciates that or not. The business owner (and friends) didn't react appropriately and may have done significant damage to their businesses and personal images as a result, effectively negating any perceived or real positive "uplift" to the communities. Commenters here are sharing their opinions formed on what they have read, seen, and/or interacted with personally, in addition to all the other factors that come in when forming perceptions/voicing opinions. Those may be off-base or not, but it doesn't mean that others get to call them out in the manner they have either. Wonder what that cheese on standard stale bread toast and burnt 3 day old potato leftovers cost. Really I would be embarrassed to serve this plate to inlaws staying over for way too long..
That IanO keeps presenting stuff like this as "must try" meals defies description. Last edited by Replacement; 23-07-2018 at 12:25 PM. Its inferred dynamic. Those that have the most difficulty receiving any criticism have perhaps not had much of it having lived in sheltered positive upbringing where every attempt is met with unconditional praise. For instance like what is spawned by no fail grading. How dare the real world intervene and offer actual critical review of work. I'm not defending the terms used to describe the owners involved, the terms are unnecessary adjunct. The owners are biting their own hands, that much is clear, and for no profit or gain. Responding in anger is seldom a good idea and usually makes us look like fools of which we are all guilty. But few would do that regarding their livelihood. That is inherently unprofessional. There we go and I agree. The sandwich was amazing, the potatoes delish with some herbs, the right amount of salt and slightly crispy which I like and the watermelon balanced the heaviness of the rest with a fresh, light, finish. Does it have amazing colours or look as good as it tastes, perhaps not, but honestly one of the best plates in a long time. Pane perdu by definition is stale makeover bread. Burnt leftover stovies are the same drivel. Meaning that the cubed watermelon (actually looked like tomatoes) is the only fresh thing on the plate. This is inherently a dish that doesn't deserve to be on a "must try" list anymore than refried beans on stale toast would be. This dish wouldn't even earn the term leftovers. Its this kind of review that just reduces expectations in a Mac n Cheese and pork hocks hipster universe. There is fine dining or "must try" out there presumably. One wouldn't know it from this thread. Again, the pain perdu was one of the most delicious things I have had in a long time and is a must try. heh What was the delicious part of that? Maybe break it down. Not that anything could sell that much. Most restaurants have ways to incorporate leftovers. Its pretty much the food version of whats left laying around improv. Not in a particularly good way. I love Cite Francophone. Have had a couple decent specials in that restaurant, but its also been hit and miss and while I recommend the facility, the building, as one of Edmontons great works, all of the restaurant incarnations there have been pretty ordinary. I don't get to too many fine establishments these days, and this isn't one, but a shout out to a good meal at Chop on the Southside(Ellerslie). Of note the first time I was offered a gluten free bun (I'm celiac) from any establishment in this city. Small things. Kudos, as I stated at the restaurant. It took this much care to cause me to ask the waitress to thank the head chef for at least allowing a Celiac to have a pre dinner bun that everybody else takes for granted. I was effusive with praise. Desert was also good. Main fare wasn't really all that great. I had the GF Salmon dish. The accompaniment of Quinoa was bland and not even with anything else in it. The plate seemed to be going for visual rather than taste. The salmon also lacked in flavor. The braised green beans were the best part of the entrée. Last edited by Replacement; 23-07-2018 at 01:04 PM. Aioli - rich enough, but let the sandwich do the talking. I've found Cafe Bicyclette to be sadly disappointing every time I've gone: ordinary food and with an ambiance more like Second Cup than Paris. Maybe it's better in the evenings. The farmers market at Cite Francophone is also a major let down and seems to be slowly dying. Last time I went there were only a few vendors and no produce at all: just crafts etc. Very sad, TBH. Yep. To be clear I like the actual building and specifically the lowered patio that it creates which protects from the elements. It also opens to the afternoon and evening sun the way it is situated. To me its the best designed outdoor are found anywhere in Edmonton for winter use. Its highpoint as a facility is during Flying Canoe. A great time to go there and to the area and ravine. It is too bad there has not been better restaurants here. Or even more than one. In my experience Café Bicyclette have been better in evenings but we've only had specials then and so can't comment on their regular menu. Apparently, posting a negative review means that you hate Edmonton and everything and everyone in it. Edmonton based restaurants are apparently supposed to be immune to any and all review that fall short of glowing. These people wouldn't last 5 minutes in a "world class" city. "...a fantastic place that made Edmonton such a cooler spot then our typical..."
Fascinating bit of insight into the pov of our entrepreneurial/hospitality industry. Although not surprising - broadly speaking, as I've written here before, the attitude of the servers who work in these (mostly mediocre) places tends toward the "You should be happy a place like this exists and a person like me deigns to serve you" (I'm looking at you D. Costa) And of course, ownership/management sets the tone. I'm always taken aback by good service - shout out to Bundok, consistently excellent service. I find this particularly humorous since on other C2E board threads an argument for all the Downtown strum and drang is that visitors to Edmonton will of course want to enjoy our urban experience. Well, cities that are interested/invested in tourists have restaurants/nightclubs/night spots that know how to provide quality service. We are seriously lacking in this regard.